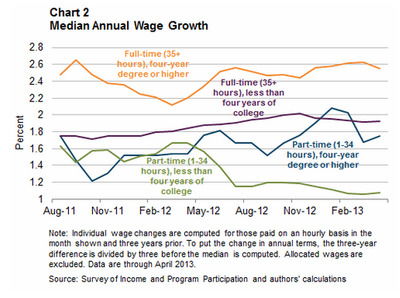 For part-time workers, wages are going nowhere. 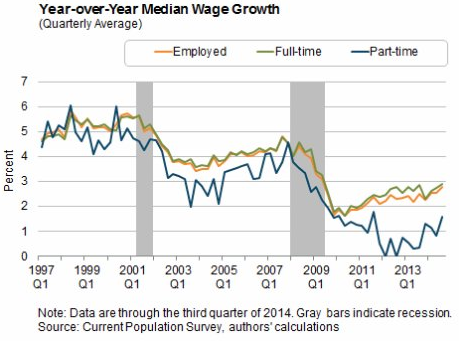 This is the latest chart from John Robertson and Ellyn Terry, published at the Atlanta Fed’s macroblog. As the researchers say in their post, the data is pretty noisy, but it seems clear that something happened to part-time wage growth between 2011 and 2013 — after tracking pretty closely to full time wage growth over the last decade and a half, it pretty clearly detached in 2011. In a previous post, Lei Fang and Pedro Silos at the Atlanta Fed broke down the median wage growth by education as well as time spent at work. There’s a pretty clear drop there for part-time workers without a college degree, that then stagnates just above 1% wage growth around mid-2012. Given that the inflation rate was 3% in 2012, these workers were effectively getting a pay cut. Atlanta FedThere’s a pretty clear drop there for part-time workers without a college degree. There is some good news in the recent data, in that wages seem to be rising a bit more. But there are still a lot of involuntary part-time workers feeling the sting even more thanks to wages that just won’t budge.